Have you got a flight at stupid o’clock? If so, you will want to book a room at one of the Leeds Bradford Airport hotels the night before. If you are like most people, you will already have had a quick look at hotels online, only to be met with an abundance of options and extortionate prices. It can be a massive headache! Search For Airport Hotels The Easy Way! Well, consider UKACP your pain-relief, as we make finding the right hotel easy and affordable. You will be able to easily search through the options we have available by using our handy search box. 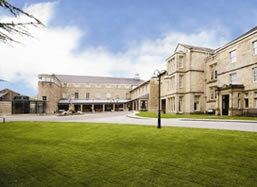 Simply enter your details and we will show you the relevant options you have for airport hotels in Leeds Bradford. You can list the results based on what is important to you – from price, to parking, to room service. Each hotel is displayed with a summary of the most important information and you can click for further details. Once you find a hotel you are happy with you can book it with a few easy steps. You’ll make some excellent savings in the process as well. The Chevin Park Country Hotel well get you in the holiday mood. It’s a beautiful hotel, which is set in 44 acres of woodland. Just make sure you don’t get lost before your flight! The restaurant is an AA rosette-winning establishment. You won’t be leaving with an empty stomach – that’s for sure. 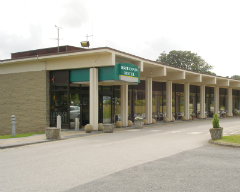 There are several family friendly restaurants located near to Leeds Bradford Airport. The Britannia is a popular choice. This hotel is located just three miles from the airport. There are some great facilities too, including a comfortable lounge area, restaurant a health club, free wifi and a swimming pool. The latter two will surely help when you've got the kids in tow! Airport hotels with good disabled facilities include Mercure Parkway and Britannia, for exmaple they have widened doors, handrails and in the Britannia the lift will accommodate wheelchairs. The Britannia Hotel and Weetwood Hotel both have transfers available upon request. You will need to call the Weetwood Hall Hotel two weeks in advance to make your transfer arrangements. So don’t forget! Don't forget that if you decide not to stay in a hotel the night before you fly you can still save money on our Leeds Bradford airport parking packages. We will always save you anything from 15 to 60% compared to the car park gate price.